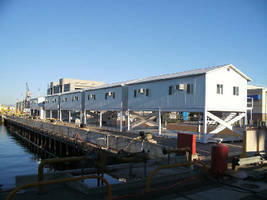 Challenge: Additional office space was needed for support personnel at the Naval Station. 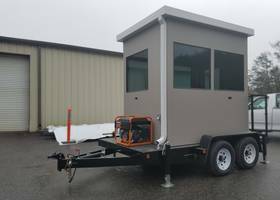 These structures had to take up a minimal amount of space while providing both office support and work area as well as observation vantage point for personnel. The buildings also had to meet the specs for coastal conditions and a seismic zone. Solution: Panel Built was contracted to design, engineer and construct 6 elevated exterior office towers. Each building was designed with 90mph wind loading on a seismic 4 mezzanine base. 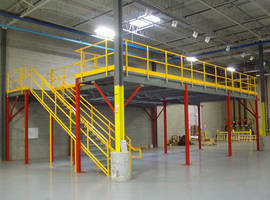 There were two platforms on each system, one to support the building and one at ground level for additional work area. Panel Built Delivers: Panel Built delivered and installed the buildings on schedule, coordinating with naval engineers on existing rebar and electrical conduit placement in the slab. 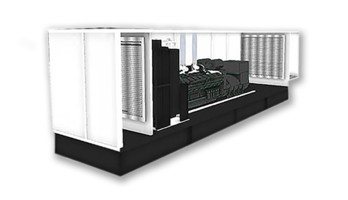 Project Specs: Six 20' x40' exterior structures on custom powder-coated platforms with 10' upper deck height. Lower deck is 1/4" aluminum diamond plate. The overall height of each building system is 22' .